Today is 10/10, half of 20/20 (OK mathematically it's the same), so it's the perfect day for the International Agency for the Prevention of Blindness (IAPB) to promote a day of awareness of vision impairment through World Sight Day. After two years without any global theme, this year IAPB has decided – on popular demand – to revisit the global theme idea. 2013 is an important year, as it will mark the launch of a new WHO Action Plan on the prevention of avoidable blindness and visual impairment 2014-19. 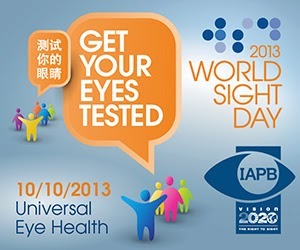 In keeping with the main thrust of this new Action Plan, the theme for World Sight Day 2013 is: Universal Eye Health. The Action Plan identifies its purpose as to ‘increasing access to comprehensive eye care services that are integrated into health systems’. The theme for World Sight Day 2013 comes from this focus. ‘Universal Eye Health’ embodies many critical aspects of successful eye health uptake, and so IAPB will use a rolling theme – ‘Universal Eye Health’ will remain the theme for the next couple of years. Each year, they will focus on one aspect of the theme to develop a “Call to Action”. While Sight Day normally focuses on helping others with vision impairment, this year it is a little different. For 2013, the call to action is: Get Your Eyes Tested. While they really mean in general for everyone to get their eyes tested, to me it is an important refocusing. To me it reads 'Get YOUR eyes tested', where the word your stands out. Yes everyone should get their eyes checked, and we can all help promote that, but with everything going on make sure you get checked out. In the efforts to help others out, so often we lose focus on ourselves, but not this year. This year everyone involved in vision impairment wants you to make sure you take care of yourself first, for as we often say here at GMM - you can't help make others well you aren't well yourself. And we all know the track record of men and getting themselves checked out for any kind of help. Besides getting your eyes checked, another way to keep your eyes healthy is to protect them. Per the American Optometric Association, scientific studies and research have shown that exposure to small amounts of UV radiation over a period of many years increases the chance of developing a cataract and may cause damage to the retina, a nerve-rich lining of the eye that is used for seeing. Wearing sunglasses with UV protection can help reduce those effects. Luckily there is a stylish and philanthropic way to do so. To promote World Sight Day, TOMS is asking you wear your shades inside to raise awareness for visual impairment and blindness worldwide and post about it with #BESHADY. 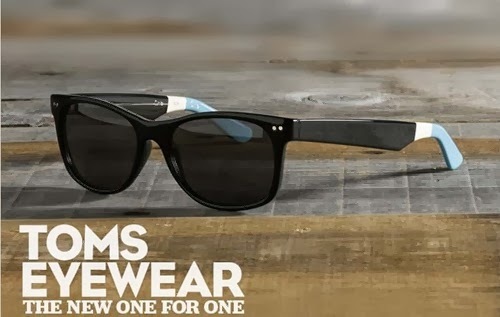 TOMS who was first known for its buy-one-give-one model for it shoes where for every pair of shoes bought they give a pair of shoes to a child in need, does a similar thing with glasses. For every one of their sunglasses sold they give a pair of prescription glasses to a child in need. In htis way you can protect your eyes and also help protect someone else's. The good news is that up to 80% of the world's blindness is avoidable. Avoidable blindness is defined as blindness which could be either treated or prevented by known, cost-effective means. Although there are many other causes of vision impairment, VISION 2020, the global initiative for the elimination of avoidable blindness, seeks to address the main causes of avoidable blindness, in order to have the greatest possible impact on vision loss worldwide. So go ahead, make a spectacle of yourself today and wear your sunglasses inside. Not at night like Corey Hart sang, just inside. When people ask what's up - tell them about World Sight Day and Universal Eye Health.